Last night my grandma asked me if diabetes affects eyesight. Absolutely. Long-term high blood sugar levels can lead to cataracts, retinopathy and glaucoma. This is why it’s essential I visit an eye doctor every year (regardless of my actual eyesight problems). Additionally, when I experience severe low blood sugar, I sometimes get blurry vision (or in the case of a seizure black out completely). I stretch my legs and sprint down the paved path along the four-lane highway in Silver Spring, Maryland. The sun sets behind me, and the bugs eat at my exposed calves, but I relish this 70-degree temperature. After 5 miles of gravel pathways, wooden bridges, and cracked sidewalks, I only have one more uphill battle of this last mile to conquer. And then my speed starts to wane. I can’t seem to muster the strength to push myself harder even on this decline. Something feels off. My muscles are tired and weak, and my heart rate is accelerated past the point of normal. I stop at the next intersection, and as the stoplight turns red, I look down at the phone strapped to my right bicep. I’ve decided to take a break from my other writing projects to write this blog post. Because even though I may take a break from my blog, my diabetes does not take a break from my life. And upon learning some unexpected news recently, it seemed appropriate to mention it here. So I’m not back to regular blogging but I may pop in every now and then. I’ve spent the past week and a half in Cookietown (aka my parents’ house during the holidays). And my blood sugar levels have never been so amazing. 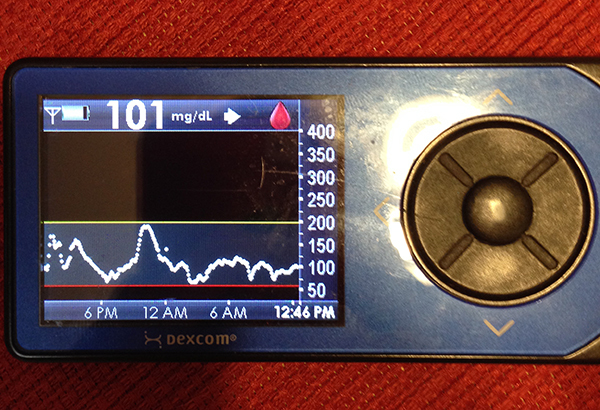 I even reached a no-hitter a couple of times (keeping my blood sugar levels within the lines for an entire day). That means no extreme highs (above 200) and no extreme lows (below 70). So how did I manage this? Well I’d like to think it’s because I’ve gotten better at managing this disease in the six and half years since I was diagnosed. But the real truth is completely based on biology.